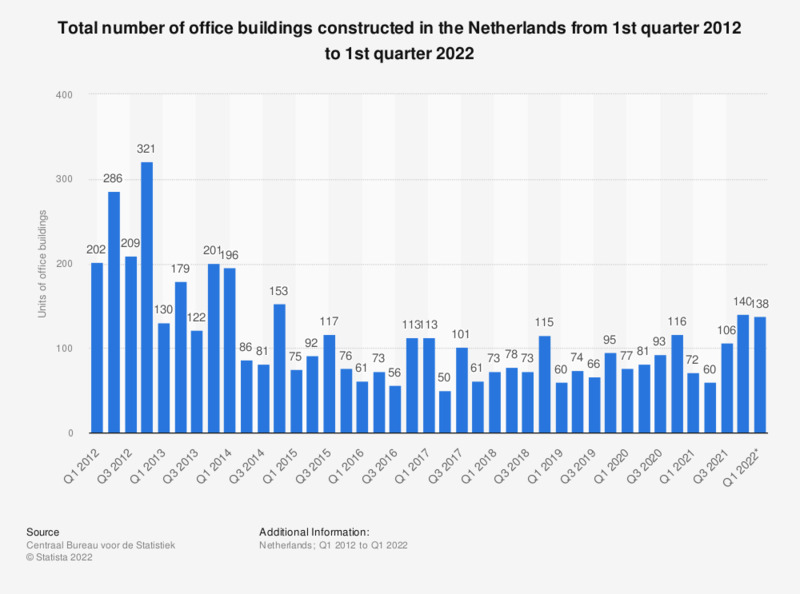 This statistic shows the total units of office buildings constructed in the Netherlands from the first quarter of 2012 to the fourth quarter of 2018. The source defines office buildings as: "a building, or part of a building, where a consultancy firm, an accounting or law firm, an insurance company or city hall is located". In the fourth quarter of 2018, 114 units of office buildings were constructed in the Netherlands. This is an increase when compared to the previous quarter. * The numbers provided for 2018 are provisional. Everything On "The office market in the Netherlands" in One Document: Edited and Divided into Handy Chapters. Including Detailed References. Statistics on "The office market in the Netherlands"